Let’s face it, sometimes, or rather, most of the time, there are just not enough hours in the day to get everything done. Between family time, social commitments,work commutes, daily errands, and appointments, our free time is stretched further than ever before. You don’t need to skimp on self-care just because your to-do list keeps growing. These three quick-and-easy nail care tips can add more time back to your day while keeping your nails strong and healthy. 1. Start with a daily dose of cuticle oil. A quality cuticle oil can revitalize dry, brittle nails and prevent future peeling and cracking. A quick coat of conditioning oil each night can stimulate circulation and nail growth, repair brittle nails, and protect against damage from acrylic polishes, UV gel products, and dry winter weather. Simply massage a small drop of cuticle oil to your nailbed each night, either on your bare nails or over polish. This will replenish your nail’s natural oils while providing quick protection and long-term repair. As a plus, cuticle oil will extend the life of your manicure. Also look for treatments that include essential nutrients such as vitamin E and rapeseed oil that soothe your nails and help maintain their balance of natural oils. 2. Follow up with a strengthening base coat. A layer of nail hardener that also serves as a base coat will act as a shield for your nails, offering a much-needed conditioning boost while also trapping in moisture. Select one with a dual action formula that both protects and shields.A high-quality nail hardener can transform your nails with just a few treatments. Nail hardeners can be used as a base coat before applying polish or applied daily for added nourishment. By creating a durable surface that moisturizes your nails, a base coat can also help prevent staining. 3. Top it off with a splash of color. The last thing you need when trying to add time back to your day is to reapply your nail polish each week.A high-quality polish enriched with botanicals and mineral oils will not only nourish your nails but also adhere to your base coat for quick-drying, long-lasting, high-shine color. You can never go wrong with a lovely light pink or soft gray polish. These palettes are perfect for every workplace or a chic complement to your day-time and night-time attire. To kick things up a bit, make a statement with bold blue nail polish. Experiment with different shades of blues, grays, turquoises, and greens and your nail polish will transition effortlessly from day-to-night and season-to-season. Some final do’s and don’ts to consider when it comes to self-care. · Don’t sacrifice your health for the sake of convenience. · Do look for products that contain hydrating botanicals like vitamin E, chamomile, evening primrose, and rapeseed oil that nourish, heal, strengthen, and help grow your nails. This wholesome blend is a value-added formula that will enrich your self-care routine. · Don’t use—or at least try to avoid—products that contain harsh chemicals like formaldehyde,resin, TPHP, acetone, ethyl tosylamide, xylene, DBP, toulene, and camphor. 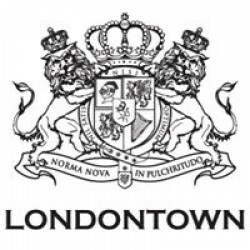 LONDONTOWN creates hydrating nail care and color products that protect your entire nail. With a blend of vitamins and botanical oils, their products restore and strengthen, giving your nails that healthy, manicured look. LONDONTOWN features vegan, gluten-free, and cruelty-free polishes that combine nail aesthetics with restorative nutrients. A manicure or pedicure isn’t an occasional “splurge” for most women (and men!) anymore.In 2017, Americans spent a staggering $8.5 billion on salon services—a $2 billion increase from 1998. A trip to the nail salon is a weekly or bi-monthly occurrence for many these days, and salon goers spend an average of $1,345 each year on nail services, according to Statista.com. Manicures and pedicures have grown more complex too, with everything from intricate nail art to airbrush designs to 24-karat gold gel manicures. While nail salons provide undeniable aesthetics, researchers have found that you can achieve healthy, strong nails by following these surprisingly simple tips. If you’re looking for a good daily supplement to keep your nails healthy and strong, add a dose of biotin to your diet. Research published in the Journal of Drugs in Dermatologytested popular nail care treatments and supplements to determine which ones actuallyimproved nail health. Their tests included the following supplements:alpha-tocopherol, biotin, copper, iron, selenium, silicon, retinoids, retinol, retinal, vitamin A, vitamin B12, vitamin C, vitamin E, and zinc. While each of these vitamins and minerals have ancillary health value, researchers found that 12 out of the 14 supplements had no correlation with improved nail health. Researchers found that the best treatment for weak, brittle nailswas a 2.5 milligram dose of biotin or a 10 milligram dose of silicon daily. When it comes to nail care, pay particular attention to what is in your nail care product. Look for treatments that include essential nutrients that soothe your nails and maintain their balance of natural oils. A quality cuticle oil with a conditioning formula will moisturize dry nail beds and prevent painful peeling and cracking. A nourishing formula will also stimulate circulation and nail growth, repairingbrittle nails and protecting against damage from acrylic polishes, UV gel products, and dry winter weather. You don’t need to stop at your cuticles either. Revitalize your entire nail with a coat of cuticle oil each day and enjoy that fresh manicure-like feel without a trip to the salon. The best way to trap in moisture (and shine) is with a quality nail hardener. Find one with a dual action formula that both conditions and shields, and your nails can transform from drab and brittle to strong and glossy with just a few treatments. Nail hardeners can be used as a base coat before applying polish or applied daily for added nourishment. By creating a durable surface that moisturizes your nails, a base coat will also extend the life of your nail color. At the end of the day, you only have a finite amount of time to spend on nail care. Simplify your routine by selecting products that add a nourishing blend of hydrating ingredients such as evening primrose, chamomile and cucumber extracts, rapeseed oil, vitamin E, and garlic. These botanical extracts and oils are a sure-fire way to keep your nails looking and feeling healthy and glossy, even if you don’t make it to the salon. 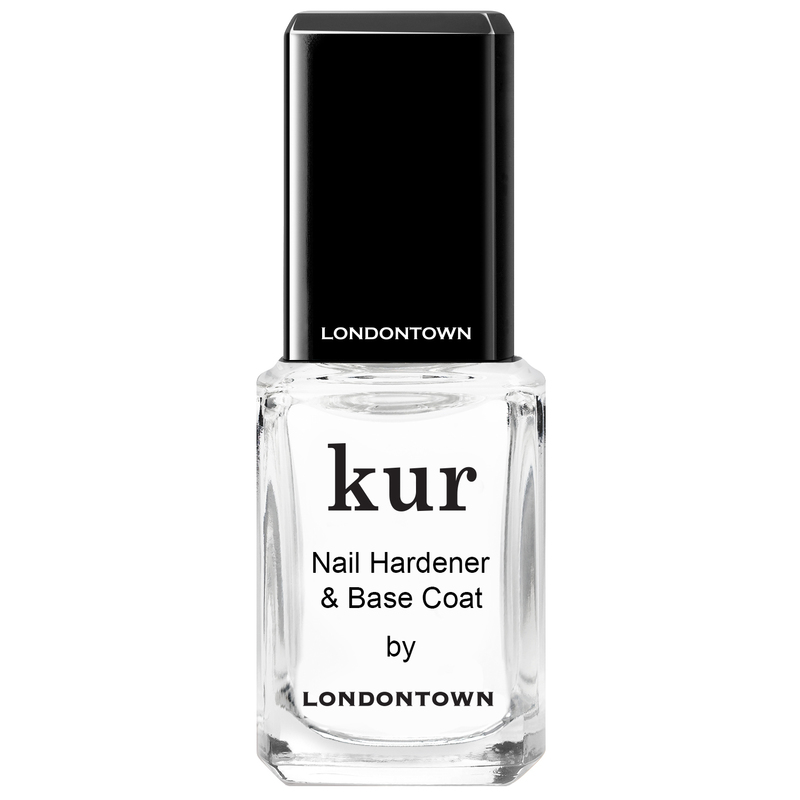 LONDONTOWN creates hydrating nail care and color products that protect your entire nail. With a blend of vitamins and botanical oils, their products restoreand strengthen, giving your nails that healthy manicured look. 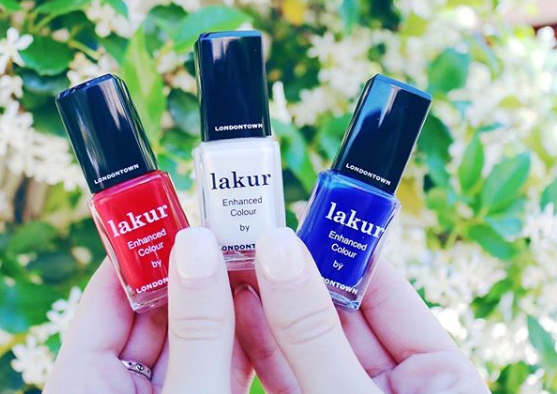 Fromsubtle beige palettes to bold blue nail polish, LONDONTOWN features vegan, gluten-free, and cruelty-free polishes thatcombine nail aesthetics with restorative nutrients. Giving yourself a manicure at home can often be a difficult task if you don’t do it very often. This guide is formulated for the amateur nail painters out there who want to get better but struggle with getting a glop-free, dent-free, mess-free manicure. Follow these tips for a goof-proof at-home manicure. If your nails tend to be soft and too flexible, a nail hardener is your go-to for a base coat. This improves the appearance of dry, brittle nails by creating a durable surface for your nail polish. Condition your nails and prevent peeling, cracking, and splitting with a 9-Free nail hardener and base coat. Make sure that your base coat is completely dry before painting your nails with a colored polish. A thick and creamy formula is your best bet for a luxe manicure at home. Nail polishes that are thin and watery don’t dry in a consistent finish and tend to be super frustrating to use. Choose a color that is highly pigmented and a shade you love. Unlike all of the teenage girls at a sleepover who shake their nail polish bottles like maracas, this technique does more harm than good. Shaking nail polish in the bottle does mix it, but it also creates air bubbles within the formula. To get the mixing effect without the bubbles, roll your favorite blue nail polish bottle between the palms of your hands a few times. Stirring the formula instead of shaking it mixes it and gives a creamy finish, just like you want. Two coats of nail polish on top of your base coat is all you need for an at-home manicure or pedicure. Don’t use thick layers as this will likely bubble or dry weirdly. Use two thin coats of your favorite 9-Free nail polish that includes hydrating and nail-strengthening ingredients. Allow the first coat to dry for at least 10-15 seconds before applying the second coat. Follow with a protective matte coat or a gel-like formula that hardens and creates a glossy finish. This protective clear coat is crucial to protecting the gorgeous color you just painted onto your nails. Make sure that the top layer polish you choose doesn’t need UV light to cure. A top coat extends the life of your manicure and protects against chipping, splitting, or fading. Protect your creative work with a protective clear coat with a gel-like finish. This trick is a manicurist secret that is slowly becoming a trend across the nail care industry. Massage cuticle oil onto the tips of your fingers after your at-home-mani is finished drying. If your manicure is looking a bit tired after a few days or a week, apply the cuticle oil again to refresh your nail bed and hydrate your cuticles. Note: never, ever cut your cuticles. This can open up your skin for infection and other risks. Get healthy and moisturize cuticles with gluten-free, vegan cuticle oil. LONDONTOWN delivers nail care and color products that go beyond the surface to provide care to the entire nail. Their exclusive blend of vitamins and botanical oils restore, hydrate, and strengthen nails from within for a perfect manicure with every application. Vegan, gluten-free, and cruelty-free, their holistic approach to nail care combines nail science with restorative nutrients. Pampering yourself while pregnant can often seem like a minefield. The rituals and routines that you might normally use to relax and rejuvenate may not be considered safe for your growing baby. Taking care of your fingers and toes is an important form of self-care. Don’t feel like you have to wait nine more months to get a mani or pedi. Here are a few tips for safe nail care during your pregnancy. Salons can be a hot spot for toxins and unhealthy ingredients, like acetone. You can get a salon manicure and pedicure at home by using safe alternatives to gel nails or acrylics. Start with a 9-Free nail hardener as your base coat. This strengthens your nails while smoothing out the surface for a perfect mani. It also prevents splitting, breaking, staining, chipping, cracking, and peeling. Nail hardener makes your manicure last longer and creates a shield for your nails. Depending on your pregnancy, you might be experiencing chronically dry hands and cracking or peeling cuticles. Use a cuticle oil to hydrate and condition dry cuticles. It replenishes the fingernails’ natural oil balance while also moisturizing cuticles. Choose a vegan and gluten-free formula that includes nourishing ingredients. These toxic ingredients can irritate nails and skin, cause hormone disruption, trigger respiratory and throat irritation, and other health issues. It’s best to choose a 9-Free nail polish, versus a 3-Free or 7-Free, because it replaces all of the undesirable elements listed above with nourishing and healthy ingredients. Nail polishes that include botanical extracts and oils help nails grow healthier, lock in hydration, soothe damage, and prevent brittleness. Look for nail lacquers that contain elements like rapeseed flower oil, vitamin E, chamomile extract, or evening primrose oil. Make sure that your nail care products, like nail hardener or top coat polish, are also 9-Free. 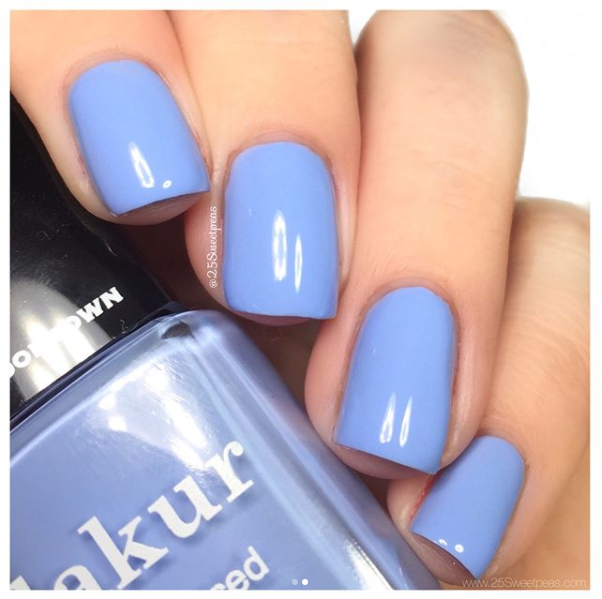 You can still have a stunning blue nail polish without the harsh ingredients. Right around your second or third trimester, reaching your toes might be more difficult than you’re used to. If you’re desperate for a pedicure, especially if your pregnancy falls around summertime, it might be worth asking your partner or bestie to help you out. This can be pretty annoying for some of us, but can be fun and worthwhile in the long run. The people closest to you want to help you in any way that they can during this special, but admittedly difficult, time in your life. Give them the opportunity to help you with this simple yet self-care focused ritual. As beauty brands start to embrace the “clean beauty” trend spreading across the cosmetics industry, smart consumers are checking the ingredients list for harmful or toxic ingredients. From skincare to makeup to nail care and more, nourishing ingredients are at the forefront of clean beauty. If you’re a nail care enthusiast, you’ve probably started to see labels for “9-free” nail polish. All of these have proven negative results, from respiratory to fertility issues. Some of them can cause severe skin irritation and negatively affect important hormones. From salon gel UV nails to drugstore formulas, these ingredients are still prevalent and causing dangerous health issues. Being 9-free means that the nail lacquer is developed without those ingredients and uses healthier alternatives instead. Specific nutrients and botanical oils have proven benefits for strengthening nails, locking in hydration, and prevent cracking or peeling. Choose a nail hardener with cucumber extract, chamomile extract, and rapeseed oil. These are rich in silica to heal and prevent brittleness while making the nail stronger. Nail hardeners are much better than UV gel lacquers not only because of their ingredient list, but hassle-free removal with everyday nail polish remover. Salon gel polish is notorious for being dangerous to remove without acetone, a chemical that causes poor nail growth, peeling, and breakage. They also keep your nails flexible, so they’re less prone to chipping or breakage. Nail hardeners make for great base coats and help prevent staining from highly pigmented nail polish. If you’ve experienced the painful side effects of using nail polish with more toxic ingredients, using a cuticle oil is crucial for treating peeling or irritated cuticles and nail beds. Cuticle oil helps nails grow stronger at the source. It also extends the life of your manicure by preventing splitting and peeling, unlike UV gel nails or acetone. Finish off your nourishing manicure with vibrant blue nail polish on top of your nail hardener and cuticle oil application. Nail lacquers that have ingredients like Vitamin E, evening primrose oil, and garlic extract ensure that the vibrant hue you chose doesn’t peel, strip, or harm nail growth. Choosing 9-free products ensures that you’re protecting your nails from toxins and nourishing them with hydrating and restoring results. Nail care and color with proven nutrients offer the luxurious self-care your nails deserve.